The right to exist of every company is based on the product life cycle. Each product has a life path, which consists of a growing phase and a phase of decreasing growth. Each company must keep responding to product developments to keep breathing new life into the cycle. Does this cycle also apply to DJs? Can something be said about the digital life cycle based on the connections on Facebook and Twitter – the level of connections and connectivity with fans – and a DJ’s right to exist? Using the data of Rankingz, DDMCA and Jibe Company researched the cycles of DJs who have featured in the DJ Mag Top 100 over the last 10 years. 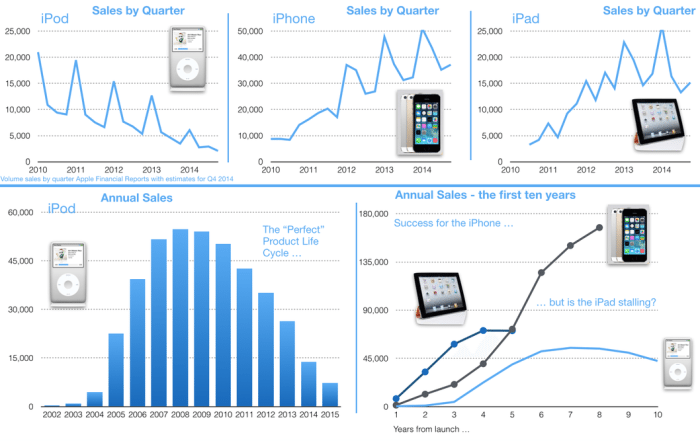 The sales development of the iPod, iPhone and iPad shown in the image above displays the growth and decrease of the sale at a certain time. With regard to the iPod, which has been on the market for 13 years, it can clearly be seen that an explosive growth took place from 2003, when iTunes was launched. In the graphic below left you can see the decrease in iPod sales after 7 years. 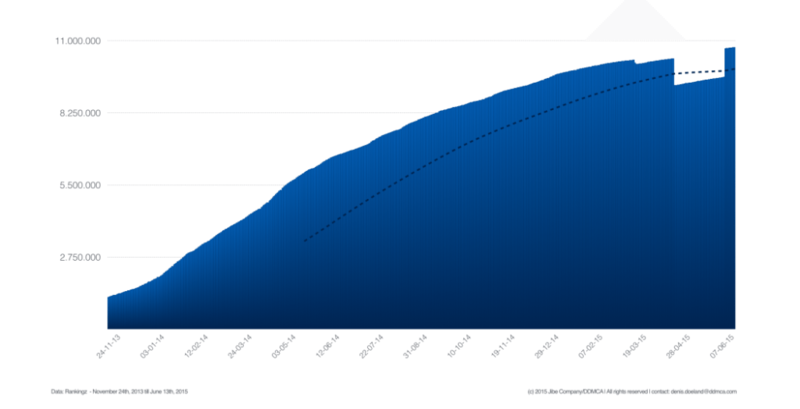 iPad sales are stagnating five years after its introduction. This is shown in the graphic below right. Slowly but surely, it seems that the iPod and iPad have had their best days. The sales development of all three products displays a curve, which can be traced back with statistics. In statistics there is a common graph, the ‘standard normal distribution’. With sufficient number of observations this displays a symmetrical distribution over a measuring criterion. By showing the distribution schematically a clock shaped curve is formed, also called the Gauss curve or Bell curve. When the iPod sales over the years are added up to calculate the average sales figure, there is also a standard normal distribution. In mathematics this is called the standard deviation, the distribution of a series of numbers around the average or the deviation to the average. With the iPod this is the deviation to the sales peak. It seems fitting to use the clock graphic in the life cycle of a product. Issues such as standard deviation, modal class, median and variations can be deployed to explain and predict the life cycles of products. The innovation theory, as described in the Diffusion of Innovations book, is a theory that comments on the spread of an innovation, a new product or idea within a group. The original theory was conceived by Frenchman Gabriel Tarde, but made popular by Everett Rogers. The theory is well known specifically in the marketing world, where the description of the life cycle is central. Rogers distinguishes various stages, in which different groups are identified which accept a product or new idea. The theory is visually translated in a similar clock graphic. Rogers presents a subdivision, in which he points out innovators, early adopters, early majority, late majority and laggards. Clients which are named as innovators buy newly launched products, and early adopters are the followers of the innovators. On the basis of his theory it can be assumed that 2.5 percent of the total target group displays innovative behavior (innovators). 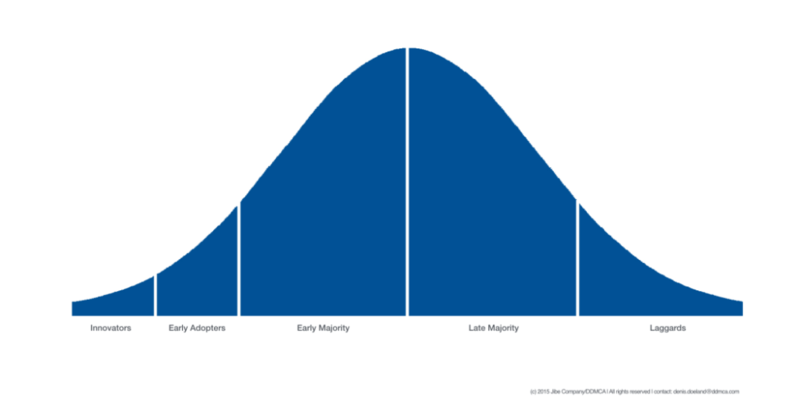 The segment of the early adopters is estimated at 13.5 percent of the target group. The communication transfer of the innovators to the early adopters is critical for the success of a product in the future, also called chasm. Additional focus is given to this theory on vanAnaloognaarDigitaal.nu, in the chapter ‘The Tipping Point as a guide’. In communication to the market, innovators can be used as a means to stimulate the growth of a product. This application is called testimonial. The majority of the target group covers 68 percent (early and late majority). The remaining 16 percent of the target group is called laggards, those that lag behind. The introduction phase: the launch of the new product on the market requires attention from the management for the quality of the product (banishing start-up problems) and communicating about the product with the innovators. The explosive growth phase: establishing the product in the market now requires strong communication with the early adopters (testimonial) and the quantitative distribution (available everywhere). The ceiling phase: the majority buys the product, the distribution is qualitatively regulated and the price policy starts to become important to assist advancing its penetration. The maturity phase: the laggards and the loyalists are the only ones who still buy the product. Marginal improvements to the product, together with price changes, keep the product in the air as long as possible. Until the moment where there is a loss, a product provides cash flow, which will enable new products to be financed. The digital life cycle of a DJ shows, to a large extent, a resemblance with Rogers’ theory. The phases in the cycle can be expressed in the following terms: introduction, growth, maturity, ceiling and regression. It is interesting to apply the theory to a DJ. As expected, generally the same developments – which one normally sees with a product– can be predicted. The phases can be applied to the connections via Facebook and Twitter. Every DJ who finds himself in the internet ecosystem passes the different phases in the cycle. The speed with which each DJ moves through this cycle depends on, among other things, the demand and the way in which he is able to connect with his or her fans and maintain this connection. Rankingz has been collecting social media data of approximately 400 DJs for the last 4 years, including DJs who have featured in the DJ Mag Top 100 in the last 10 years. When you consult the graphics many of these DJs find themselves almost at the ceiling phase. The policy concerning the content which should maintain the connections is becoming increasingly important. Maintaining and advancing engagement with fans is central to this to remain in the maturity phase. Most DJs appear to have hit their ceiling. Moreover, for a number of them the relative regression is no longer far off. When you look at the dynamic average of the number of page likes, the amount of connections on Facebook, then the graphics of Armin van Buuren and Carl Cox show strong indications they have had their day. On Twitter it appears that for most DJs there is not a cloud in the sky. Most of them are still in the growth phase. Only ATB shows the first signs of a possible regression. However, the growth of three DJs is beginning to subside: Infected Mushroom, Richie Hawtin and, once again, Armin van Buuren. Tiresome, but at the same time also challenging is that the cycle is being completed increasingly faster. Looking at the cycle of Martin Garrix, it is evident that the introduction phase went quickly after arriving in the DJ Mag Top 100 in 2013. This phase led to an explosive period of growth in a shorter time than was experienced by Armin van Buuren, for instance. The last few months it seems that the ceiling phase for the DJ is already in sight. Also when you look at the other graphics, you see that the cycle with Martin Garrix is proceeding faster. Has Martin Garrix already reached his ceiling? The DJ will quickly need to deliver a good new single and good content to get the curve on Facebook to rise again. DDMCA and Jibe Company, together with Rankingz are scrutinizing more DJs. Not every DJ proceeds beyond every phase; some new DJs do not get past the introduction phase, while other DJs have been in the maturity phase for many years according to Rankingz data. The model of the digital life cycle is still in a premature phase. However, it can be suggested that there is a relationship between the connections on Facebook and Twitter and the theory of Rogers. The data therefore has a predictive value, where something can be cautiously said regarding the right to exist of a DJ based on the connections he or she has on social media. Various DJs show a decline, which can have consequences on the long term for the right to exist of such a DJ. When the decline continues there is less scope on the long term for the DJ. What must you do to prevent decline? A good content strategy helps. A good strategy can allow you to create and curate content which is relevant for the target audience at the right time. This leads to strong relationships with fans. With good relevant content you distinguish yourself from your competition who do not follow a strategy. In addition, such a strategy helps to discover who at which moment, requires what content to achieve your aim. Furthermore it also helps to discover what the best form and best method of offering this content is. Connecting the strategy to the aim of your organization and measuring the final result helps you to make clear what the added value of content is for your fans. 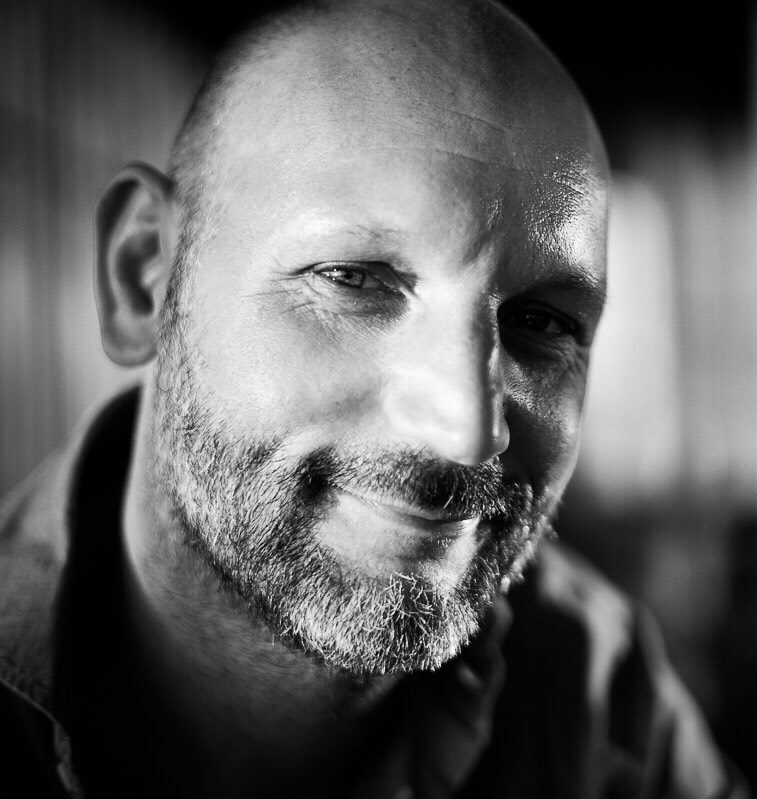 The aim is to connect, and content is the method of connecting. By sharing the content consistently, and maintaining that in a disciplined way, you will see that you connect with increasingly more fans and get on the right path to win the trust of your fans. Result: the curve of the digital life cycle is rising and the ceiling is not yet in sight.